Over 70,000 pedestrians are injured in automobile accidents each year in the United States. In 2013, over 1,250 of those injuries were in Tennessee. Preventing these accidents, injuries, and sometimes even deaths should be a priority for drivers and pedestrians alike. The following are ways that both drivers and pedestrians can increase their awareness and decrease the risk of pedestrian injuries on and around our roadways. Always be on the lookout for pedestrians. Pedestrians may not always walk where they should, and drivers should constantly be vigilant. Slow down. Following all posted speed limits will better enable you to stop or otherwise react to an upcoming pedestrian. When you see a pedestrian in a crosswalk, stop well back from the crosswalk. Make sure that other approaching vehicles will be able to see the pedestrian as well. If a vehicle is stopped at a crosswalk, you should stop as well. Never pass a vehicle stopped at a crosswalk. Be especially watchful in conditions that may lessen visibility. When it is dark or raining outside, pedestrians are harder to see and increased vigilance is necessary. Never, under any circumstances, drive under the influence of alcohol or drugs. Pay close attention to speed limits and crosswalks in school zones and neighborhoods, where children are likely to be present. Pedestrian accidents are especially common at night or in bad weather. Increase your visibility by carrying a flashlight and/or wearing reflective clothing. Cross streets at designated crosswalks whenever possible. 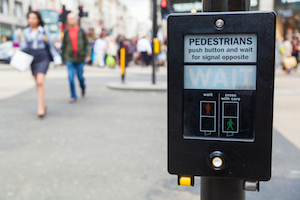 The decreased risk of injury is worth walking a bit out of your way to use a nearby crosswalk. If a crosswalk is not available, behave in a predictable way. Find a well-lit area with good visibility, and wait for a sufficient gap in traffic to cross any road. If a sidewalk is available, use it. If there is no sidewalk, make sure to walk facing traffic. Never assume a driver sees you. Try to make eye contact with drivers as they approach you to be sure that you have been seen. Do not walk on freeways, interstates, or other pedestrian-prohibited roadways. Do not drink alcohol or take drugs before walking. Just as these substances can impair a driver’s judgment, they can also impair a pedestrian’s judgment and ability to respond properly to a situation. If you would like to discuss your pedestrian injuries in a free, no-obligation consultation, call us at 615-742-4880 or toll-free at 866.812.8787 or simply fill out this form and we will call you. Our experienced attorneys will discuss your case with you and let you know if we can help. We handle all pedestrian accident cases on a contingency basis which means we only get paid if we recover money for you.